photograph F. Buis, www.fjodor.nl Renate Loll is Professor in Theoretical Physics at the Institute for Mathematics, Astrophysics and Particle Physics of the Radboud University, Nijmegen. She also holds a Distinguished Visiting Research Chair at Canada's Perimeter Institute for Theoretical Physics. - Loll received her Ph.D. from Imperial College, London. 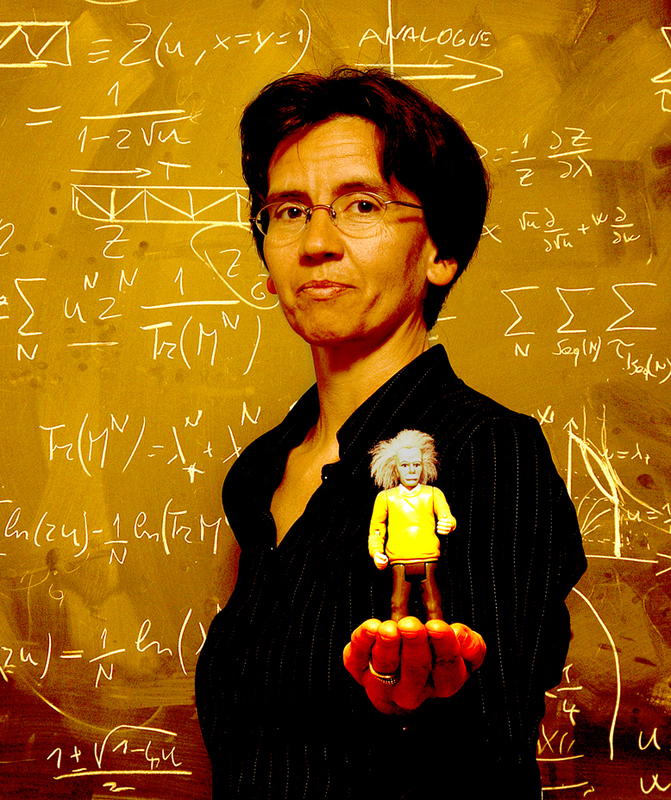 She has previously worked as a Heisenberg Fellow at the Max-Planck Institute for Gravitational Physics in Golm, Germany, and held a professorship at Utrecht University, The Netherlands. Loll works on developing a theory of quantum gravity, reconciling the beautiful geometric description of space and time laid out in Einstein's theory of General Relativity with the insight that all of physics at its most fundamental level must be described by quantum laws of motion. She is one of the pioneers of a new approach to the nonperturbative quantization of gravity, that of Causal Dynamical Triangulations which in recent times has produced a number of remarkable results. These include a dynamical derivation of the fact that space-time is four-dimensional (something that can be taken for granted only in classical gravity) and that it has the shape of a de Sitter Universe (like our own universe in the absence of matter), and of the so-called wave function of the universe which plays an important role in understanding the quantum behaviour of the very early universe. Remarkably, one also finds that the dimensionality of spacetime reduces smoothly to two at short distances, indicative of a highly nonclassical behaviour of spacetime geometry near the Planck scale. These results are obtained by superposing elementary quantum excitations of geometry which have a causal structure (allowing us to distinguish between cause and effect) built into them at the very smallest scale. Loll is recipient of a VICI award by the Netherlands Organisation for Scientific Research (NWO). She is Editorial Board member and Subject Editor of the international journal Living Reviews in Relativity, and Editor of Combinatorics, Physics and their Interactions (Annales de l'institut Henri Poincare D). Loll is member of the Royal Netherlands Academy of Arts and Sciences (KNAW), of the Academia Europaea and of the Council for Natural Sciences and Engineering of the KNAW. N. Klitgaard and R. Loll: Introducing Quantum Ricci Curvature, Physical Review D 97 (2018) 046008 [arXiv: 1712.08847, hep-th]. J. Ambjørn, A. Görlich, J. Jurkiewicz, A. Kreienbuehl and R. Loll: Renormalization Group Flow in CDT, Classical Quantum Gravity 31 (2014) 165003 [arXiv: 1405.4585, hep-th]. S. Jordan and R. Loll: Causal Dynamical Triangulations without Preferred Foliation, Physics Letters B 724 (2013) 155 [arXiv: 1305.4582, hep-th]. J. Ambjørn, S. Jordan, J. Jurkiewicz and R. Loll: Second- and First-Order Phase Transitions in CDT, Physical Review D 85 (2012) 124044 [arXiv: 1205.1229, hep-th]. J. Ambjørn, A. Görlich, J. Jurkiewicz and R. Loll: Planckian Birth of the Quantum de Sitter Universe, Physical Review Letters 100 (2008) 091304 [arXiv: 0712.2485, hep-th]. J. Ambjørn, J. Jurkiewicz and R. Loll: Emergence of a 4D World from Causal Quantum Gravity, Physical Review Letters 93 (2004) 131301 [arXiv: hep-th/0404156]. A. Dasgupta and R. Loll: Proper-Time Cure for the Conformal Sickness in Quantum Gravity, Nuclear Physics B 606 (2001) 357-379 [arXiv: hep-th/0103186]. J. Ambjørn and R. Loll: Non-perturbative Lorentzian Quantum Gravity, Causality and Topology Change, Nuclear Physics B 536 (1998) 407-434 [arXiv: hep-th/9805108]. R. Loll: Volume Operator in Discretized Quantum Gravity, Physical Review Letters 75 (1995) 3048-51 [arXiv: gr-qc/9506014].